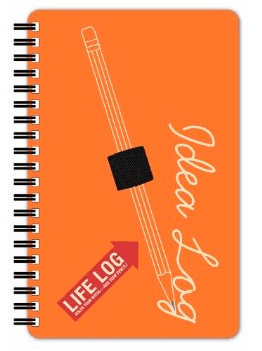 Our Idea Life Log taps into today's list-making, self-improvement zeitgeist by providing a clear, organized format in which to catalogue genius in all its forms. With a tracking grid for inspiration, brainstorming, and projects, it provides both breadth and depth in a compact, portable format. Life Logs appeal to the obsessive-compulsive in all of us. 128 pages with a clear, organized format including tracking grids and section dividers. Log bok has a hard plastic cover with an elastic penholder. Dimensions: 4.5" x 7"